The Everlast Notebook is reusable over and over again. While there are plenty of smart notebooks and pens already on the market, the Everlast notebook feels just like a traditional notebook and provides a classic pen and paper experience, while still allowing users to upload images digitally via its companion app. “Create. Scan. Erase.,” is their motto. Using any pen from the Pilot Frixion line, users can draw and write on the notebook pages in the same way they would on a regular notebook. Once you are done with a page, you can save your work via the Rocketbook app. 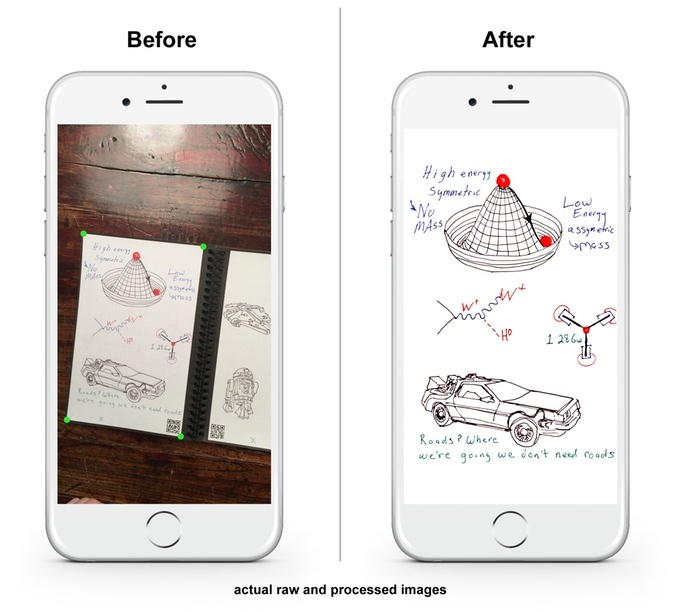 This app uses your mobile device’s camera as a scanner and automatically crops and rotates pages, which can then be synced to a number of cloud services including Dropbox, Google Drive, Evernote, and Slack. You can even scan items out of order as QR codes on the physical pages will tell the app the page number and the pages will be put in order once uploaded digitally. To erase work on the physical notebook, the user simply wipes the page clean with a damp cloth – it has to be damp as a dry cloth will not work. This is where Everlast designers also emphasize that the notebook is not a whiteboard book. The key to creating a smart notebook with the traditional feel of pen and paper was finding the “optimal synthetic polyester blend” that would work with Frixion ink and look like regular paper, not the high gloss finish of a whiteboard. So, try as you might, but the writing will not wipe away without water. This feature also helps with making sure pages remain smudge free while they are in use. 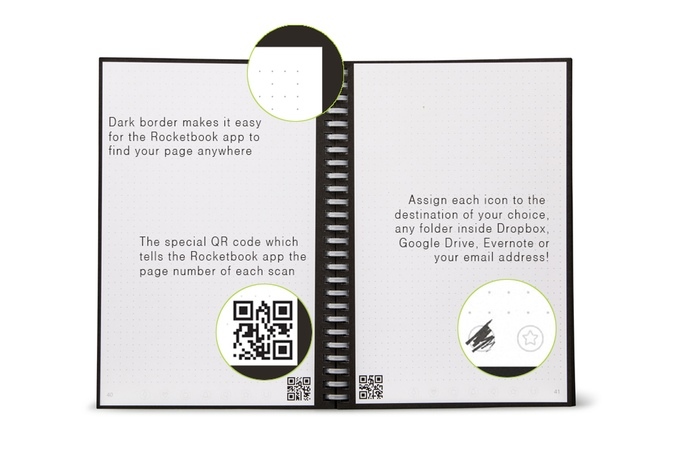 To make cloud organization of pages even easier and quicker, the Everlast notebook has seven symbols at the bottom of each page. Each symbol can be assigned a cloud destination of your choice. 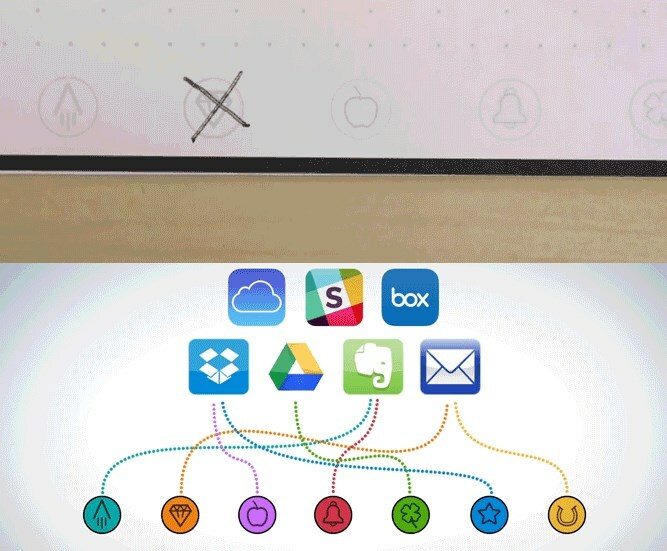 Once the symbol is marked, the Rocketbook app will automatically store your pages in the right place. This Kickstarter project has been wildly successful, raising over $761,000 from over 12,000 backers. You can learn more and order your own Everlast notebook here for $34, with deliveries expected around April 2017. Everlast notebook has seven symbols at the bottom of each page. Each symbol can be assigned a cloud destination of your choice.